"When Your Qi Flows, Your Health Glows!" Build strength, health and vitality trough the ancient practice of QiGong! Qigong is a well-being practice that often involves: mindful movement and/or stationary postures; breathing techniques; self-massage; and mental focus. 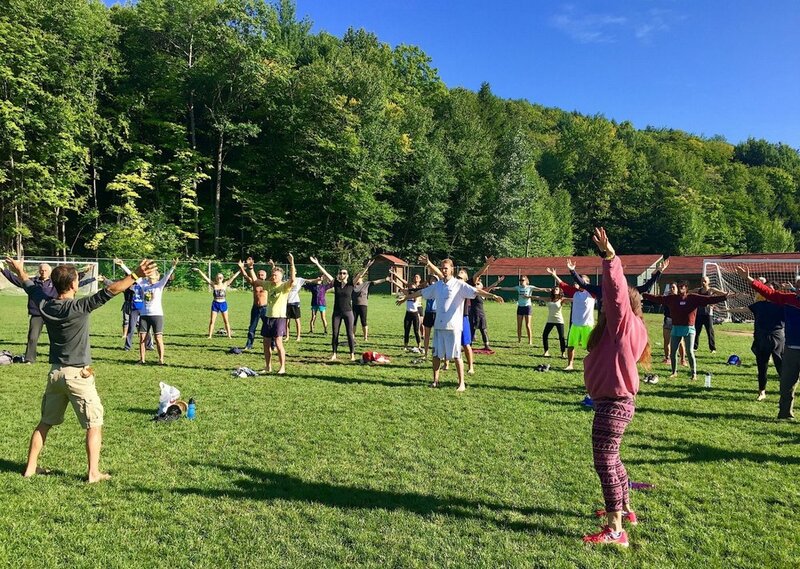 Qigong (often pronounced chee gung) means “energy cultivation practice”— and helps people to better produce and manage their overall energy and vitality! Are there different forms of Qigong? Yes, there are many forms of movement-based Qigong. There are also “medical qigong” (hands on healing techniques) and “martial arts” forms (like kung fu). Qigong is believed to be thousands of years old and began in the Eastern part of the world. NO. It does not require anyone to join or give up their current faith or religion either. All are welcome to practice it and enjoy the health benefits it provides! Is it similar to Tai Chi or Yoga? It has some similarities to both Tai Chi and Yoga as it includes the importance of posture, breathing, and focused intention to promote better health and well-being. Qigong is sometimes referred to as the “grandmother of Tai Chi”; as well as “Chinese Yoga”. YES, overall it’s easy to learn (assuming you have a good teacher and can follow basic instructions). This is one of the key differences with Qigong vs. other practices such as Yoga or Tai Chi. It’s often much easier to learn; and the positive benefits it provides can often be felt immediately! How long does it take to do each day? There is no set number of minutes or time. So… as long as you want it to take. However, it’s often a good idea to commit to at least a minimum of 10 minutes a day to see good results. A structured Qigong session in class format is often 30-60 minutes. What are the benefits of Qigong practice? More overall energy (combats fatigue). Elevated mood (combats depression; more happiness). Better sleep (look and feel younger). Improves digestion and elimination (better nutrition and detoxification). Better breathing (helps with asthma, bronchitis, COPD). Less stress (feeling more relaxed; able to handle life’s challenges more easily). Improved physical balance (less falls in elderly; better overall athletic performance). Builds muscle strength (great for injury prevention, and performance in activities of daily life). Lowers blood pressure (manage and prevent hypertension). Improved brain performance (better focus and concentration; more mental clarity). Decreases pain and inflammation (combats arthritis and other health problems). Increasing bone density (helps prevent osteoporosis). Strengthens the immune system (prevent illness, colds, and autoimmune disorders). Enhanced overall quality of life (more overall happiness, love, and joy in life!). The next Workshop Will be held on Feb. 24th, 2019 in Roswell, GA.
REGISTER for the next class series!